It's not an effect you see very often or at least I don't see very often. Most of the time when we paint our gun barrels, we give them a quick coat of GW Boltgun Metal followed by a wash of Badab Black and call it a day. Sometimes, I'll add some soot stains to the end of the barrel especially if it's a plasma weapon or a flamer. Those just cry out for the effect. Besides, it makes them look so much better for such an easy thing to do. In this case though, I didn't want to just add some "soot" to the end of the assault cannon. It's a far too powerful weapon to just build up a little dirt at the end. According to the fluff, they are notorious for overheating, warping and malfunctioning due to the heat created by the volume of fire it can put out. The barrels are considered expendable and changed out after each mission. Nothing like a disposable weapon. I wanted to make the barrels look like they've been warped by heat. Actually not warped, but the heat has been so intense that it has started to change the color of the metal. So I went looking at a few real world examples and found a handful of automotive tailpipes that had this effect. The metal goes through a series of color shifts as it gets closer to the hottest portion. I made a few notes and after looking at some examples and came up with this chart. To duplicate the effect, I used 4 washes and two colors. I started by painting the barrels GW Boltgun Metal and gave them a wash of GW Badab Black. That's standard practice. To get the heat effect, you start at the muzzle (the dangerous end) and work backwards. The first wash is GW Asurmen Blue followed by GW Leviathan Purple and then finished with GW Gryphonne Sepia. I did one right after another and blended where each color met the next. You don't need huge bands of color either, just a suggestion of the color is more than enough. One thing you need to make sure you do is make the blue section a bit bigger than the rest so that you can go back when dry and add a bit of silver on the tip since it has gotten so hot it's burned clean. I've never see that effect before, but it's awesome. You could post a step by step, I'm sure it shall be very interesting. 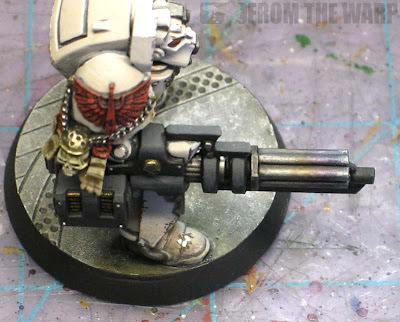 "How to paint soot stained gun barrels" is a great post too. WOW. Thank you. That is one tip I will have to keep in mind the next time I go to paint Assault Cannons. A very simple technique. Actually painting a model just like the one you have in the pic so I'm gonna give this a try. Thanks for the info. I'll let you know how it goes. Also, thanks for the brief history lesson of the Assault Cannon, I'm not a big 40k player so that helps. Thanks again. if you ever want a good look at this effect in real life, look for a motorcycle w/ lots of chrome, it's a great example. Take a reference picture. Arrgghh! I have to re-do all my gun barrels now! Very cool, Ron! I've done the gold/brown/black heated and burned look for exhausts and plasma/melta weapons, but hadn't tried the 'blued heat discoloration' before. That's a great effect, and I'll definitely be giving it a try! That looks really good Ron. I also do the gold/brown/black method mentioned above. I've got lots of experience with it, thanks to playing Salamanders! Very cool, I'm glad folks like this one. I kept the effect subtle on this guy, but you can push it as far as you want on your own models. 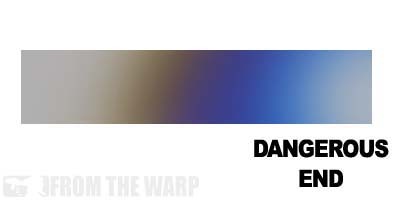 It's just another effect you can use so you're not stuck doing the brown and black soot look on the end of everything. That looks great! Definitely gonna have to steal this idea for my own stuff! like this post. thatnk you. Wow, thats a really helpful guide to achieving a great effect. Thanks. Very good tip! I was doing the same effect on my Wolves, but I did it backwards. I got the idea when painting near one of my Propane heaters. I was noticing how the metal warped with colors and wanted to replicate it. Here is the link for you if you want to check it out, http://phantomminis.blogspot.com/2011/09/one-more-model-closer.html I started the same way, but then I washed it Gryphonne Sepia, Baal Red, Asurumen Blue, and Badab Black at the end. I really like the way you pulled it off though, I will be trying this method for future models. This is an awesome tip! I'm going to have to try that pretty soon. Great stuff as always! That looks great. It's such a simple process and it really adds a lot to the model. I'm definitely going to try this. Thor: Glad you like it! It does look better than the regular soot staining you so often see. I try and save this for those one or tow places where it will really make a model shine.